The temporary administration building for M.D. 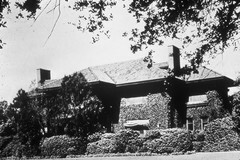 Anderson was set up in 1940 in this converted residence known as "the oaks" on the former Baker Estate near downtown Houston. Biochemistry and biology laboratories were set up in late 1942 by five scientists using this one-time stable and carriage house on the old Baker Estate. The first patients were seen in other converted residential quarters starting in March, 1944. The permanent home for University of Texas M.D. Anderson hospital began taking shape in the early 1950s in the newly designated Texas Medical Center, which only a few years earlier had been "way out in the woods". M.D. Anderson's first seven-story structure was opened for patient care on March 19, 1954. This initial building contained 310 beds, which were phased into use over a five-year period, along with facilities for cancer research and educational activities.